Readers, it's Sunday! And you know what that means? Happy 'Slungshot' Sunday! 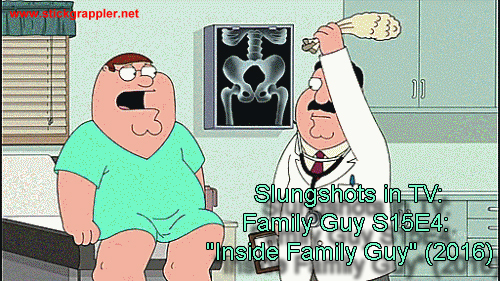 "Slungshot Sunday" are Sundays where I post a video clip and animated GIFs from a scene in a movie or tv show in which a "slungshot" was used. I have an ongoing project of documenting with video and animated GIFs of a slungshot used in a movie or tv episode. Today's entry is a scene from Family Guy S15E4: "Inside Family Guy" (2016). It is an episode where James Woods hosts a look at a typical week inside the Family Guy studio. The episode ends with a montage of Peter getting hit in the groin with a bag of nickels. OUCHY!!! Enjoy the 22 animated GIFs and video clip!